Diligently saving for retirement is by far the most sensible thing you can do to achieve a comfortable retirement. After all, if you haven’t saved enough to begin with, how you invest it will only take you so far. That said, it’s also worth considering what taxes and optimal investing can do to the savings you do accumulate. To that end, let’s tie together some of the topics we’ve covered recently, including asset allocation and asset location. In brief, asset allocation is deciding which asset classes should make up your portfolio. Asset location is deciding in which accounts those asset classes should be held (registered vs. non-registered). Combining the two, here’s an interesting question: How should you locate your asset allocations within your account types? For example, consider your broad asset allocation between stocks vs. bonds. After the tax dust settles, are you better off allocating all your bonds in your RRSP account and all your stocks in your TFSA … or, can you expect to come out ahead by allocating a mix of stocks/bonds in both types of accounts? The answer depends on what you’re trying to achieve. Spoiler alert! If you’d rather not run through all the logistics, here’s the bottom line: If you are holding most or all of your bonds in your RRSP account, you’re actually holding an asset allocation that may be more aggressive (risky) than you intended. If you’re okay with that, fine. But if you’re seeking optimal asset allocation or, conversely, you’d prefer keeping things nice and easy, there may be other allocations you’d prefer. Now, buckle your seatbelt, because we may encounter some turbulence as we run through the rest of today’s discussion. First, a bit of context: Remember, you really only own part of the assets you hold in an RRSP. Based on your circumstances at the time, the government takes a cut when you make RRSP withdrawals. So, whatever you hold in your RRSP should be discounted in your calculations by the expected taxes eventually due. You have $50,000 in an RRSP and $50,000 in a TFSA. After a year passes, any stock holdings have returned 5%; any bond holdings have returned 3%. You’ll have a 30% tax rate at withdrawal (which means your RRSP is only actually worth $35,000 after-tax). Clearly, your pre-tax asset allocation is 50% stocks and 50% bonds. But, due to the tax liability in your RRSP account, your after-tax asset allocation ends up closer to 59% stocks and 41% bonds. Here’s how that happens: Let’s assume a year passes and your stocks and bonds earn their 5%/3% returns. Pre-tax, your TFSA would be worth $52,500 and your RRSP would be worth $51,500. But the 30% tax liability in the RRSP reduces its after-tax worth to around $36,050. So, your total effective worth is $88,550, or around 59% stocks and 41% bonds. Pre-tax, you’d hold $29,411 in stocks and $20,588 in bonds ($50,000 total) in both your RRSP and TFSA. After a year, each account would be worth $52,088 pre-tax (assuming the same 5% stock, 3% bond returns). Paying 30% of the RRSP to the government upon withdrawal leaves a total after-tax value of $88,550. Note that our pre-tax allocation of half stocks/half bonds is the same 50/50 mix as in scenario one (with an after-tax asset allocation of about 59% stocks, 41% bonds). This time, our 50/50 allocation is located evenly between the RRSP and TFSA, instead of all the bonds in the RRSP and all the stocks in the TFSA. In this example, our overall 50% stock and 50% bond allocation stays the same before and after tax. Running through our same expected return assumptions, we end up with only $88,400, after taxes. That’s notably less than the $88,550 after-tax outcome from first two scenarios. Lower expected returns actually makes sense, since your after-tax stock allocation ends up lower than in the first two scenarios. TFSA: $42,500 in stocks, $7,500 in bonds. Why this particular mix? After running it through the same assumptions as before, we again end up with an after-tax value of $88,400 one year out. In other words, what really matters to you is your after-tax asset allocation. If you end up with fewer stocks than bonds at that point, you can expect lower returns, regardless of what mix you started with. Based on this, it would be sensible to estimate your after-tax allocation and ensure that it matches your true risk profile. In practice, I think a lot of people look only at their pre-tax asset allocation. 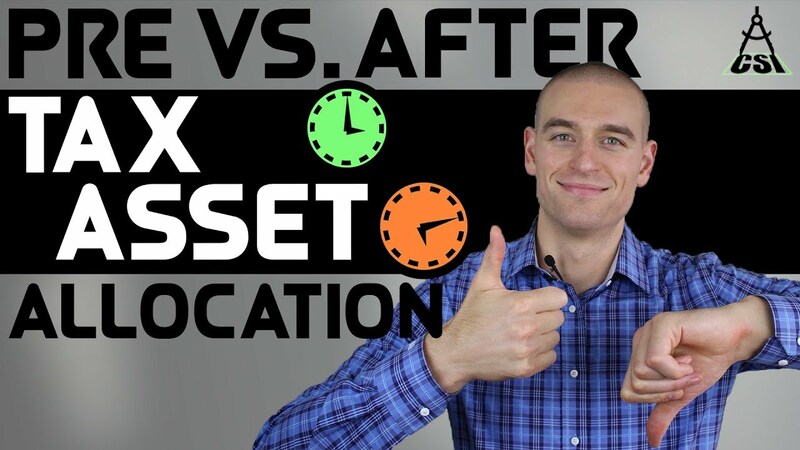 As we stated at the outset, if you have tried to optimize your asset location by holding most or all of your bonds in your RRSP account, you are likely to end up with an asset allocation that may be more aggressive than you had intended. This might not be such a bad thing. It leads to higher expected returns due to a more aggressive stock allocation than you may have intended. But if the added risk you weren’t planning for causes you to abandon your plan entirely when the risks are realized, well, that’s no good either. Accounting for after-tax asset allocation adds more complexity to the portfolio management process, which adds to the challenge of optimizing your asset locations. All of these issues go away if you simply hold the same asset allocations in all accounts. So, is the added accounting worth it? That’s a call you’ll want to make for yourself. What’s your favorite approach? Think about the tradeoffs I’ve described here today, check out my video, and let me know. While you’re at it, be sure to subscribe for future allocations of Common Sense Investing.